Aeris' Mapping Platform (AMP) measures accesses via map units. Map units provide a consistent way to correlate use of both interactive map tiles and static maps. Your AMP subscription will determine the number of daily map units you have access too. A single map unit is equivalent to a single 256x256 raster map tile with a single layer. You can estimate the number of tiles for use to display an interactive map by dividing the height and width by 256 and rounding up to the next whole number if it's not divided evenly. The exact number tiles may be slightly higher as the size of the <div>, or <iframe>, the center of the map may change this number slightly. Additionally, some mapping libraries may request an extra row and column of tiles to improve the user experience while panning the map. In the above example, if using just a radar layer the number of estimated map units would be 12 tiles * 1 layer, or 12 map units. If using two layers (either as separate layers or combined), the estimated map units would be 12 tiles * 2 layers = 24 map units. Each successive pan or zoom may render new tiles, increasing the total number of map units utilized. Estimating the map units for static map requests works the same way as with interactive map tiles, though the result is more definitive since you are not relying on a third-party mapping library. To calculate the number of tiles for use to display an static map, divide the height and width by 256 and round up to the next whole number if it's not divided evenly. If the same static map included three layers, such as a base map, alerts/advisories and radar, the total number of map units would be 12 tiles * 3 layers, or 36 map units. Static maps will be cached in the browser’s memory for a period of time. The cache time will be dependent on the update interval of the weather layer being requested. For example, radars update every 6 minutes, where as, a temperatures map may update once an hour. Tiles are cached in the browser’s memory for a period of time. The exact cache time will depend on the update interval of the weather layer being requested. For example, radar layers update every 6 minutes, whereas temperatures may update at least once per hour. Native applications should follow a similar memory or file caching strategy to reduce the total number of map units requested by your account. 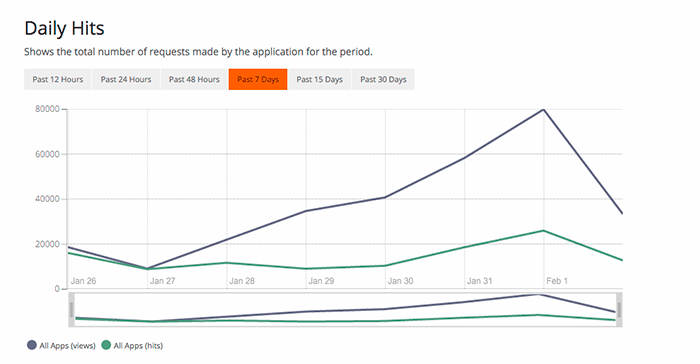 Current and past access statistics can be viewed within your account dashboard. Heads Up! Map unit stats are not real time as there may be a delay before the most recent map views are added to your statistics. The total current day accesses/map units can be viewed from the primary dashboard screen. To view accesses over time or by individual applications within your account, select the “Usage” tab within the dashboard.